Welcome to Sunbridge Institute, an independent, not-for-profit adult learning community. Sunbridge offers world-renowned Waldorf teacher education programs, along with professional development and general interest courses and workshops on Waldorf Education, Waldorf teaching, organizational leadership, and the arts. The teachings of Rudolf Steiner, the founder of Waldorf Education, are at the heart of the Sunbridge mission, and we are dedicated to the support of Waldorf Education in North America. Register for this weekend’s Project Management workshop. Sunbridge is celebrating 100 years of Waldorf Education! Read about The Foundational Teachers’ Course of 2019 coming this summer to our Elementary program and open also to all Sunbridge program graduates on an auditing basis. Waldorf Early Childhood Teacher Education at Sunbridge Institute is a low-residency program that exceeds WECAN expectations for providing a philosophical, artistic, and practical foundation for Waldorf early childhood teaching, birth to school age. Waldorf Elementary Teacher Education at Sunbridge Institute is a low-residency program providing appropriate credentials and practical, artistic, and philosophical foundations for successful Waldorf teaching in grades one through eight classrooms. Waldorf Elementary Music Teacher Education at Sunbridge Institute is a 4-week certificate program designed to provide Waldorf grades 1-8 music teachers with an informed understanding of the Waldorf curriculum and the anthroposophical view of child development. Waldorf World Language Teacher Education at Sunbridge Institute is a 4-week certificate program designed to provide Waldorf world language teachers with an informed understanding of the Waldorf curriculum and the anthroposophical view of child development. Sunbridge offers an array of Waldorf teacher education programs in low-residency formats that enable students from all geographic points to become part of our learning community. Applications are now being accepted for summer 2019 entering cohorts in our Elementary, World Language, and Early Childhood Completion Track teacher education programs. Financial aid is available, and Elementary and Early Childhood program students have the option to apply their Sunbridge education toward earning a fully-accredited MEd through our partnership with The State University of New York’s Empire State College. Learn more about our admissions process here. 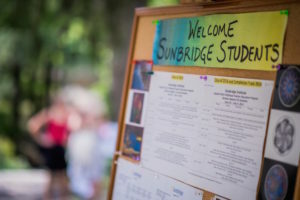 Each year Sunbridge presents a variety of courses and workshops designed for seasoned educators and administrators as well as for those who are brand new to Waldorf Education. From our Summer Series to our Teachers Conference to our “Waldorf Weekends,” we have a professional development or introductory experience to meet all levels of interest and need.